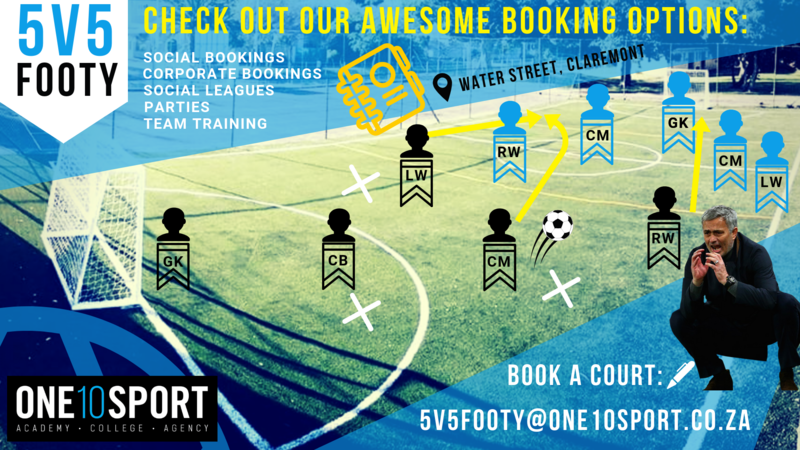 The “Five-a-side” football format is at the forefront of the game, attracting players of all levels and ages to enjoy a quick game during the week or on weekends with your mates. Players spend up to five times more time on the ball during a five-a-side game, when compared to the 11 v 11 format. With goals a mere 37 meters apart from one another, you are almost always in a shooting position, resulting in high-scoring, action packed football, with a healthy amount of fitness as an added benefit. We are delighted at our new pitch in Claremont, Cape Town and cannot wait for you to experience it with your friends, colleagues and family. If you are interested in booking our pitch, kindly visit our Book a Court page for more details or contact us below and we’ll assist you. We look forward hosting you in Claremont.